Take a long, deep inhale and exhale. Notice how slowing down your breath calms your mind and body down immediately? Well, Yin yoga is like taking long, deep breaths for your body. Specifically, the connective tissues (ligaments, tendons, and fascia) in your body. These types of tissues connect 1) bones to bones, 2) muscles to bones, and 3) wrap muscles fibers into muscle groups. Your typical yoga class might not target these types of tissues, but Yin yoga poses go deeper. 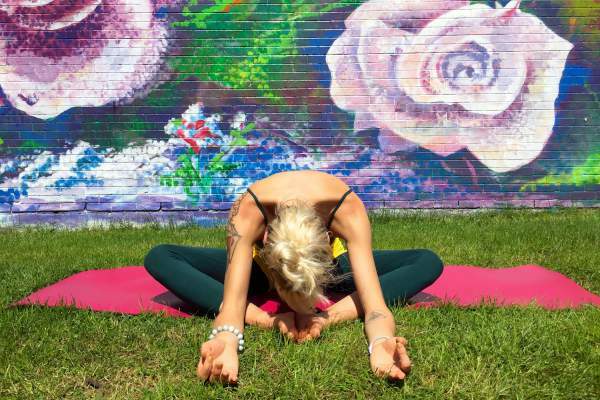 Yin poses are typically held for several minutes with a gentle pressure in order to slowly work the connective tissues that don’t stretch like muscles do. This has an extremely calming effect because a lot of stress that physically manifests into these connective tissues is released. So if you're feeling stressed and frazzled lately, here's a simple yet effective Yin yoga sequence to calm you down. From a seated position, bring the soles of your feet together and move them away from your hips creating a large diamond shape. Allow your body to gently drape over the top of your legs, resting your forearms on your thighs or shins. This posture helps to isolate a stretch in the lower back without working the hamstrings. Hold for 1-5 minutes, listening to as much pressure as your body can handle. First, grab a bolster or rolled blanket. From your knees, take your knees to the edge of the mat, and place the cushion directly in front of you. Slowly walk your hands out into Child’s pose, and allow your chest to rest on the support. Rest one cheek on the cushion. Supported Child’s pose relieves tension in the lower back and into the shoulders. It also stimulates the parasympathetic nervous system (the rest and digest mechanism, as opposed to the sympathetic nervous system’s fight or flight response mechanism), creating a calming effect. Again, hold for several minutes (halfway through, switching cheeks). Come to all fours and then release down onto your forearms. Extend your arms and walk them forward as you melt your heart towards the ground. Either rest your forehead or chin on the mat. Melting Heart Pose creates a deep stretch into the shoulders and meanwhile lengthens the spine. Hold and breathe for several minutes. Come down onto your belly and extend your arms into a T out to your sides. Rest your right cheek on the mat, and plant your left hand next to your shoulder. Use your left hand to help you roll onto the right side of your body, keeping the right arm extended. This stretch helps release tension we hold in our upper backs where loads of stress builds up. Hold and breathe for several minutes, then switch to the other side. From your back, bring the soles of your feet together and let your knees fall open wide. Take one hand to your heart and one to your belly. 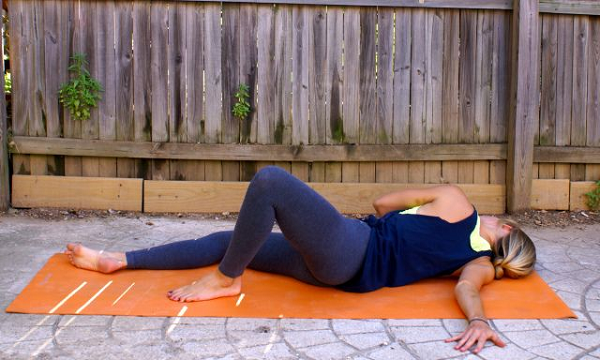 This pose will work deep into your hips. Hold and breathe for several minutes. If this is uncomfortable to hold, take your blanket (or blocks) and place it under your knees for extra support. When there’s a yang, take time to stop and find the yin. When life speeds up and stress ensues, take a deep breath for your mind and body and practice these Yin yoga poses to slow it back down. Do you have your own go-to sequence or yoga poses that never fail to calm you down? Share your tips in the comments below!